To be perfectly honest, I’ve never been a fan of sugar cookies. However, these sugar cookies are an exception! Soft and buttery, these melt-in-your-mouth goodies are the perfect accompaniment to a steamy mug of cocoa, or a good book by the fireplace. They also make an attractive (frugal!) addition to a plate of Christmas treats. They will keep for weeks in the freezer (probably longer than that, but I haven’t tried), and you can freeze them before or after baking. This recipe is one my husband grew up on, and one of those I had to get from his mom when we got married. I’m pretty sure it’s one my children will want to take with them as well someday. My husband says they are in a category of their own – somewhere between a sugar cookie and snickerdoodle. I don’t try to categorize them; I just know they are good! If you’re looking for a classic all-around holiday cookie that uses basic ingredients, here it is! Preheat oven to 350 degrees. In a large mixing bowl, beat together shortening, butter, sugars, eggs and vanilla with an electric mixer. In a separate bowl, combine dry ingredients. Stir into wet ingredients and mix well. Shape into balls. Moisten the tops of the balls slightly with water, and dip them into sugar. Place sugar-side-up on ungreased cookie sheets. Bake at 350 for 12 minutes. Brigette is a full-time wife and mother who is blessed with three amazing bundles of energy (ages 5, 3, and 1). She enjoys music, experimenting in the kitchen, homeschooling her children, finding great deals, long-distance running, and anything chocolate. Looking for more? Read more posts about Christmas Cookies & guest post. These look great! My family has lots of traditional recipes for nutmeg logs, datenut cakes, gingersnaps and very chocolatey things. Ooh, thanks for these! I am with you not being a major fan of sugar cookies, but I do love me some snickerdoodles. Have you ever substituted for the shortening? More butter, coconut oil? We try to stay away from hydrogenated oils. Thanks! I wondered that too, I was thinking of trying them using all butter. They look so awesome, I hate to mess with the recipe! But yeah, I don’t usually buy shortening. You can buy nonhydrogenated shortening, I think Spectrum has a brand, as does Earth Balance. I’ve had better luck with the Earth Balance than the Spectrum. They make really great half butter/half shortening pie crusts. You should be able to sub a certain amount of coconut oil without getting too much coconut flavor in the cookies themselves (not that that’s a bad thing, but it might not be what you’re going for). I would say maybe 2/3 cup coconut oil and 1 1/3 cups butter. However, the final product might be a little different. I’ve seen cookie recipes like this that use a mix of butter, cream cheese, and vegetable or canola oil for the fat in the recipe and they were supposed to be chewy, moist cookies, if you just want to nix shortening altogether. Good luck and let us know if you make them! The great thing about a cookie like this is it’s great if some of your family loves things vanilla and buttery, and others want things dressed up, these would nicely accept all kinds of add-ins, like Heath Bar pieces, chocolate drizzles, Andes mint pieces, crushed peppermint, rolled in part sugar and candied ginger, beautiful chunky sugar or sprinkles, nuts, dried fruit, dried coconut and pineapple (dried or crushed and drained). I’m currently pregnant and very, very into Christmas cookies! Palm shortening is a great natural alternative to regular shortening. Spectrum has a brand sold in health food stores called organic shortening, but if you look at the ingredients its just palm. I love my Organic Palm Shortening from Tropical Traditions. It’s pretty great! I was going to say the same thing. We love TT shortening and we also use Spectrum’s palm shortening too, and both of them work great in everything I’ve tried. I use Palm Shortening from Tropical Traditions! I don’t have a problem with hydrogenated oils, but I was considering substituting for convenience-to cut down the number of ingredients. I thought 2 cups of the butter flavored shortening could work for the 1 cup butter and 1 cup shortening. But at the moment I actually have shortening and I always have butter so I really don’t need to substitute. Running to the store just for butter flavored shortening would be more of an expense and hassle. Now if I just had the cream of tartar, I would try these. When I make snickerdoodles I sometimes leave out the cream of tartar AND the baking soda, and sub baking powder for both. In this case, prob 3 tsp baking powder? You might get a better answer from Google. I’ve never tried this recipe so I can’t tell you for sure how it would turn out, but in other cookie recipes it has worked fine. I haven’t ever substituted in this recipe, but according to google, you should be able to. 🙂 Let me know of you try it and you like it! These are the only sugar cookies I’ve ever loved.. I grew up eating them (Im 51). You CAN leave the cream of tartar out.. but if you do.. it changes the flavor.. which is why its in there in the first place. 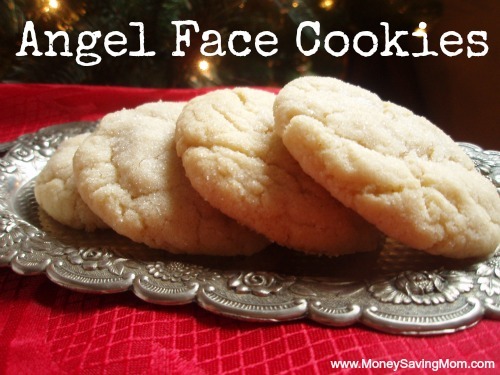 We ADORE these cookies, my kids & grandkids do too. I go buy fresh cream of tartar for them if mines not fresh and I dont use it for anything else.. its WORTH it!! You can substitute, but the flavor will be different. I’ve had Snickerdoodles made with Baking Powder instead of Cream of Tarter and Baking Soda, and they definitely have a different taste. Do you have a Whole Foods by you? They have bulk spices and I am able to buy just a few teaspoons of cream of tartar a year to use at this time. I am not a fan of the regular Christmas sugar cookie but I do love soft ones! I’ll try these out! Thank you! Can this recipe be used for cookie cutters? I’ve been trying to find a good recipe for that. No – sorry. 🙁 Maybe someone else has a good recipe they can share or link to that works well for cookie cutters… Anyone? This is my favorite recipe for cookie cutters. We make it year round using all of our cookie cutters for the various seasons. I have had nothing big success with this recipe! It rolls out nicely, the cookies are so soft.. the perfect sugar cookie! Do you think these would work as thumbprint cookies, with a dollop of jam on top? Thanks! I probably will try it and will let you know. These look so yummy! I hope to try them soon. For the person asking about thumbprint cookies, I usually use a shortbread-type dough for those. If this is a stiff dough, I bet it would work. Hmmm, might be an experiment coming on.. These would be pretty dipped in red and green sugar, I bet. I don’t have shortening either, so I may try them with something in place of the shortening. I love these. I make a very similar cookie named million dollar sugar cookie. They are my absolute favorite perfectly crisp on the outside and delicious tipped in chocolate milk. Thanks for the reminder. Maybe I’ll take some to my family’s party this weekend! 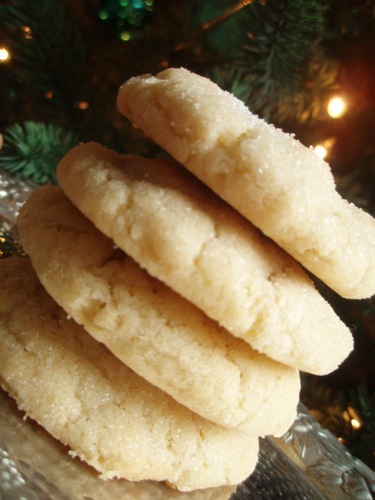 These are hands down the BEST sugar cookies I’ve ever eaten & its my only sugar cookie recipe. I replied about this elsewhere in the comments but if you leave the Cream of Tartar out.. you TOTALLY change what makes them so awesome in the first place. If you leave it out.. you are going to have a hohum sugar cookie. If you leave it in, you may find yourself tasting the very BEST sugar cookie you ever had in your entire life!! Cream of tartar isnt expensive and one tiny little tin will last you forever.. You’ll want to refresh it every 2-4 years so its fresh though..
We would have a bowl of water & a bowl of sugar.. dip it first in the water, then into the sugar, and press onto a cookie sheet, sugar side up. Most of the time we’d use plain white sugar but sometimes we also used red or green sugar at Christmas time..
You know, Im going to have make these now.. :0) Thanks!! Mine came out flat 🙁 followed the directions. Any ideas? Erin, I haven’t made these yet (though I’m planning on it!) but I used to have a lot of flat cookie problems until I started routinely chilling the dough before baking. When it’s cold (or even frozen–you can shape balls of cookie dough, freeze them, and then bake straight from frozen) the butter melts slower and they don’t spread as dramatically. The other issue can potentially be stale leaveners, but in my experience it’s more likely to be the former. I’d be curious if that solves the problem for you. I agree with Anna K. I don’t chill the dough for this recipe, but I know at least one of my extended family members who always does. That can help. Fresh leaveners are really important too. Even cookie sheets make a difference. I have a cookie sheet that’s different than my other ones, and the same batch of dough will bake VERY differently on that particular sheet. Wierd. Hope this gives you some ideas! Yes, what is it about different cookie sheets? It’s weird. I have a friend who swears by the method of baking her cookies on two sheets stacked together. She says it makes all the difference. Well, I was using parchment paper…so the last batch I took it off and they came out better. Thanks! Mine also came out very flat, although still tasty. I will have to try it without the parchment paper next time. Can margarine be substituted for the butter in the angel face cookies and butter flavored shortening for the shortening?? Did not know if this would alter the taste/consistency? Thank you for this wonderful recipe! I made these for the MOPS cookie swap and they are awesome! Yay! 🙂 Thanks for letting me know! I made these with my daughter two nights ago, and my hubby told me last night that this may be his new favorite cookie! They turned out really well. My advice is to make the balls small though because they do spread out. Not a problem for us…we love big cookies!!! I’m very sorry they didn’t turn out well. Something was definitely off with your wet/liquid measurements. Did you make any substitutions? 4 cups of flour is the correct amount, and as others have mentioned, it makes a thick dough – that even without chilling, does not turn into pancakes that have oil pool under them. 🙂 I’m not sure what went wrong for you, as many others have made these (some, like myself, for years, if you read the comments) very successfully. Others are having trouble with them spreading too much and the batch I just made didnt hardly spread at all. LOL. Trying batch 2 – this time flattening them a little myself before baking. Ok..so, when I flatten them out some before baking they turn out perfectly. yay! Just made these, substituted all butter for shortening, and they turned out awesome! I did not use parchment and I did not substitute baking powder for the cream of tartar and baking soda. Definitely going on my annual cookie baking list. (and my go to every day cookie list) Even the baking time was accurate. Thank you!! Hope everyone has a wonderful blessed Christmas. Made these yesterday as written, and they’re wonderful! They really do make 5 dozen big cookies. Only thing I changed is not wetting the top of the cookie with water, I just dipped them into the sugar. The dozen or so I used the water, the sugar clumped weirdly on the top. No taste difference, but it just looked better without the water step. Do you dip these in plain white sugar? I’m sure you could use all kinds of colorful sugars or sprinkles. Just wondering what is on the cookies pictured. Thanks! I had this recipe bookmarked for a while, and recently gave my niece the dry ingredients with the recipe as a BIRTHDAY GIFT. Her Dad told me they are the best cookies he’s ever tasted! I made up some step-by-step instructions for her with clip-art from the internet and included some edible eyes, colored sugar, and icing from the grocery store’s cake decorating section.